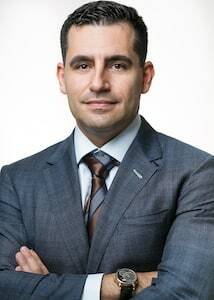 Adam Gana is the managing partner of Gana Weinstein LLP. His practice focuses on all aspects of securities arbitration, complex commercial and business litigation. As a seasoned arbitration and trial lawyer, Mr. Gana's experience includes litigation in both State and Federal Courts as well as in various alternative dispute resolution venues. He has tried more than thirty cases to verdict before the state and federal trial and appellate courts, AAA, JAMS, NFA and FINRA. Mr. Gana was named in the New York Super Lawyers Rising Stars® for six straight years, ranked AV® Preeminent™ by Martindale - Hubbell™ (the highest honor offered), and ranked by the National Trial Lawyers as one of the Top 100 attorneys in the state of New York. Should Non-Attorneys Represent Parties in FINRA Arbitration for Compensation?, New York State Bar Journal, January 2015. Broker-Dealer Licensing: Understanding the Role and Limitations of the Series 6 License, Westlaw Journal, Securities Litigation and Regulation, Volume 17, Issue 7 (August 9, 2011), also available in the PIABA Law Journal. Quoted regularly in various publications, including Thompson Reuters, the Wall Street Journal, and the New York Times. Mr. Gana has been committed to various pro bono matters throughout his career. He has dedicated hundreds of hours to inMotion, Inc. an organization designed to help women victimized by domestic violence. In addition, Mr. Gana represented a death row inmate in Alabama throughout the appellate process. Mr. Gana also taught rhetoric and debate to high school students.